En Garde! is a small-scale skirmish game based on the successful Ronin rules, in which small groups of warriors fight each other for honour or riches. Rather than just rolling a few dice, the rules allow players to make tactical decisions about how the models that they control will fight - offensively, defensively, or by applying special skills and abilities. En Garde! covers the conflicts of the 16th, 17th and early 18th centuries, when black-powder weapons started to become common in battle but martial prowess still determined the outcome. 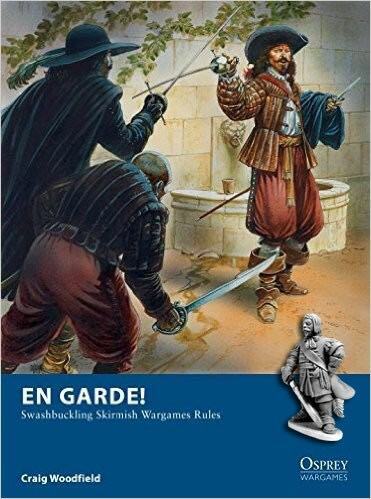 Play as Border Reivers, Conquistadors, Landsknechts, Aztecs, French Musketeers, Caribbean Pirates and many more, in scenarios that evoke classic engagements of the genre. Sub-plots (secondary objectives for each side) have also been introduced, making gameplay even more varied and exciting. Simple campaign rules allow multiple scenarios to be played in sequence and permit warbands to develop over time. An appendix is also included to provide brief rules for supernatural creatures of the period - monsters, demons, revenants and witches - and new abilities and equipment to fight them, making En Garde! the perfect ruleset for gamers who want something a bit different from the norm.